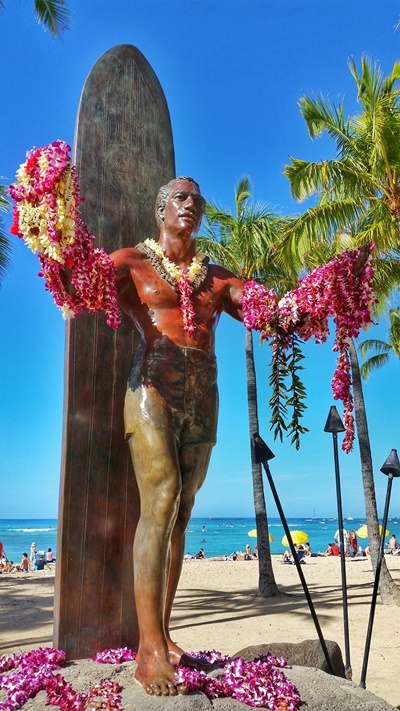 Waikiki, Hawaii: Duke Kahanamoku Statue :: oahu things to do. dukes oahu. No matter where which of the Waikiki hotels you’re staying at, there’s a good chance you’ll end up passing by the iconic Duke Kahanamoku Statue. So, just who was Duke Kahanamoku? Raised in Waikiki, Duke was a full-blooded Hawaiian, who symbolized Hawaii to millions of people. He developed into an Olympic champion and the world’s fastest swimmer. Over his Olympic career, he won 3 gold medals and 2 silver medals. Duke Kahanamoku introduced surfing to the eastern seaboard of America, Europe, and Australia. He became a hero when he used his surfboard to save lives from a capsized boat at Corona del Mar, California, in 1925. He was also a movie actor for a number of years. Later, he was elected Sheriff of Honolulu for 13 consecutive terms. He has been recognized as Hawaii’s Ambassador of Aloha since 1912. He lived from 1890 to 1968. There’s a famous restaurant in Oahu, Duke’s Waikiki, where you can further learn about this Hawaii legend. You can have a look at the Duke’s Waikiki restaurant menu here to see if you want to put Duke’s on your list of things to do in Oahu! 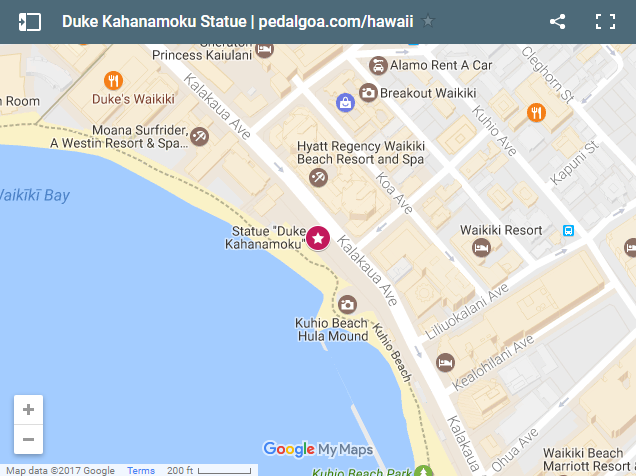 So where exactly is the Duke Kahanamoku statue in Waikiki? Have a look at the Waikiki map below! If you’re staying at the Hyatt Regency Waikiki, there’s a good chance you’ll see it every day! Explore the Waikiki map! Do you want to expand your search outside of Waikiki? See the Oahu map!